I hate to admit that I have dandruff...but I do! I have tried any and everything I could get my hands on, even that awful Tar shampoo, to no avail. I found a couppn for this and decided that I should give it a try since it has a money back guarantee. I used it as soon as I got home from the store and OMG! no more flakes!!! I can't believe how well it works, I will never buy another shampoo again! I like the way it smells and tingles the scalp but my hair was frizzy and felt limp. I got this for my sons. They have dry scalp and dandruff. It did not improve their condition any. Again, another shampoo that did not get rid of the dandruff. I just about always have flakes no matter what I do. This has been the only shampoo i have used so far that has successfully kept them away. The bonus is that it smells great too! 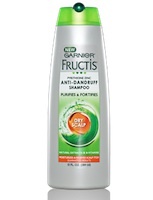 I used this shampoo and I didn't have any flakes in my hair! It has a pretty color, and smells good! I just loved the feeling of this shampoo. I can't really explain it, my scalp just felt...clean. I still had a bit of dandruff, but I only used it twice since it was a sample size.